I love women. Really. The word swell comes to mind. And I think it quite accurately describes how they see God with a swelling sense of possibility and wonder. And tonight, that God is a God of slumber parties. After a stiff-backed ride on the Vespa (look ma, up to 60mph), I found my way to Regulator Bookshop in Durham, North Carolina – yet another consolation for leaving the beloved Bay Area of California. 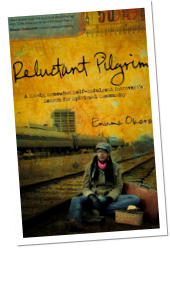 Tonight, writer Enuma Okoro was reading from her simple, stirring, and somewhat saucy memoir The Reluctant Pilgrim: A Moody, Somewhat, Self-Indulgent, Introvert’s Search for Spiritual Community (Upper Room, 2010). Baptized into the Catholic Church at age 4, Okoro was hoarding crucifixes in her drawer by age 7. Little girls, it seems, have a unique wisdom in their floppy faith. Her curiosity spilled over into graduate school at Duke Divinity (my current home) and a position at its Center for Writing, Theology, and Media. But it’s not the signposts of her journey that will stick with me. It’s her commitment to the necessity of female friendships – or the hokier sisterhood, if you prefer – that leads her to believe in a God of slumber parties. A God who gave Naomi to Ruth and Elizabeth to Mary as a testament to the radically simple notion that women need women. Not just men. Not just babies. Not just a damn good job or a damn fine pedicure. It’s metaphors like this – and the brave women who speak them – that are lacking in the church. God is not just a father, just a coach , or just a fighter…unless, of course, we’re talking about a pillow fighter. Let the feathers reign down. I cannot tell how struck I was by your last statement, “Let the feathers reign down.” There is an inescapable impression of spirituality upon it, like the unexpected ecstasy that overwhelms the soul in the hour of worship. Could this be a prayer, do you think? I wish I could stop smilin!